Bonfire of the Vanities: Danke Gott für einen Deutschen Papst! 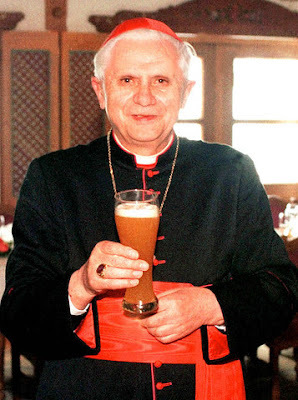 There's a similar picture on the cover of John Zmirnak's excellent The Bad Catholic's Guide to Wine, Whiskey, and Song. I bought a copy for our good-humored pastor this Christmas. Dank Sei Gott fuer einen deutschen Pabst klingt etwas besser aber trotzdem ist schoen so ein Foto zu sehen! All these years I thought it was Papst Blue Ribbon Beer! Is this available as a T-shirt? Poster? Someone get on the entrepreneurial ball, here!